For everyone's safety and enjoyment, we ask all attendees to abide by the following Code of Conduct at Stop 'N' Swap®. *Clothing, shoes, belts, hats, and accessories only, please. ** Outdoor event, subject to cancellation with inclement weather. Attend future swaps by signing up for monthly Recycling e-Alerts and be the first to hear about the next Stop 'N' Swap. Host a Stop 'N' Swap in your community! If you know of a large, indoor, handicapped accessible space let us know! If our schedule is full and we can’t get to you soon enough, we would be more than happy to offer tips on running your own community swap. Email recycle@grownyc.org or call 212-788-7900. Host Your Own Swap with the help of our DIY Swap Guide. Check it out here: DIY Swap Guide. Stop 'N Swap from GrowNYC on Vimeo. What is a Stop ‘N’ Swap? It’s a free event where people can find new homes for unwanted items (like clothes, books, shoes, toys, housewares) or take items they can use. You don’t need to bring something to take something! Simply drop any items at our "drop-off" table. We'll weigh them, sort them, and put them out on our display tables. Items on the display tables are free on a first come, first served basis. 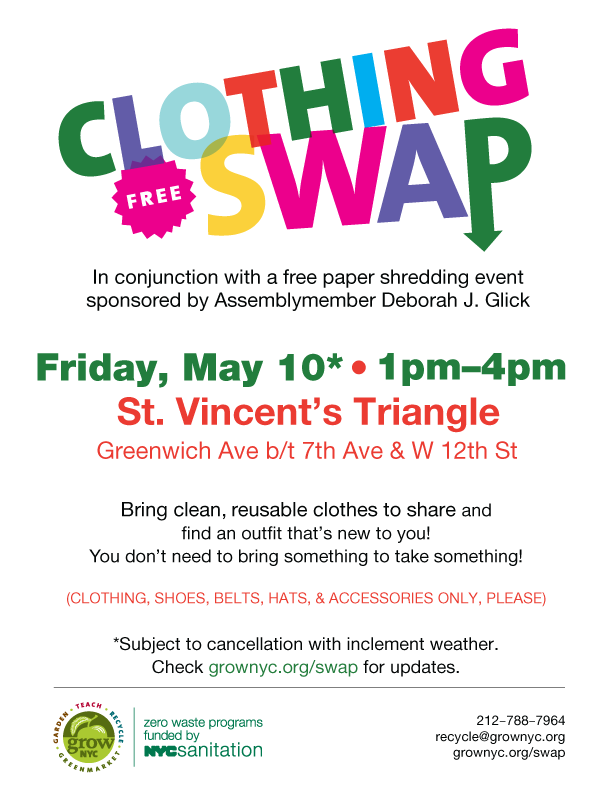 Why does GrowNYC host Stop ‘N’ Swap? 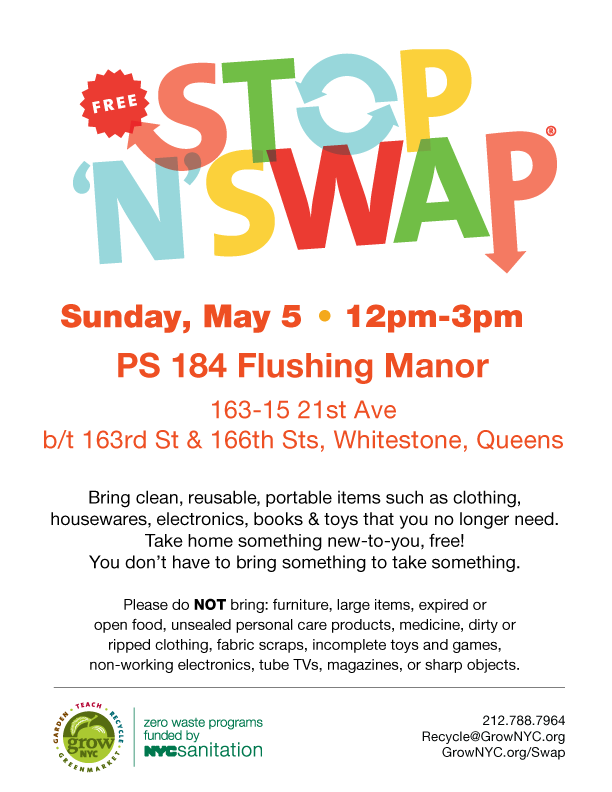 Stop ‘N’ Swap is one way we pursue our mission to reduce waste and promote reuse in NYC. 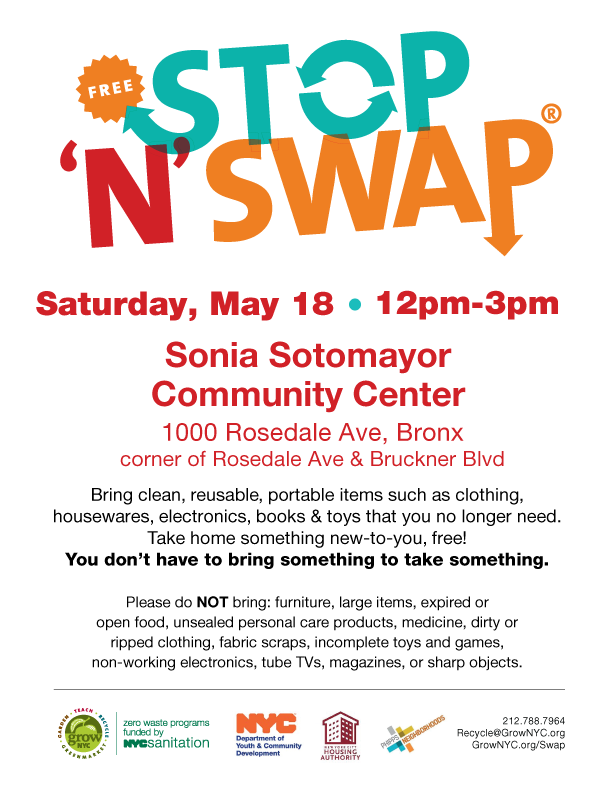 By participating in community swaps, New Yorkers simultaneously reduce their contribution to landfills and prevent the waste that comes from the production, packaging and transportation required to get new things. It's also an opportunity to engage with NYC communities about recycling resources in their neighborhood and the services of GrowNYC's zero waste programs funded by the NYC Department of Sanitation. 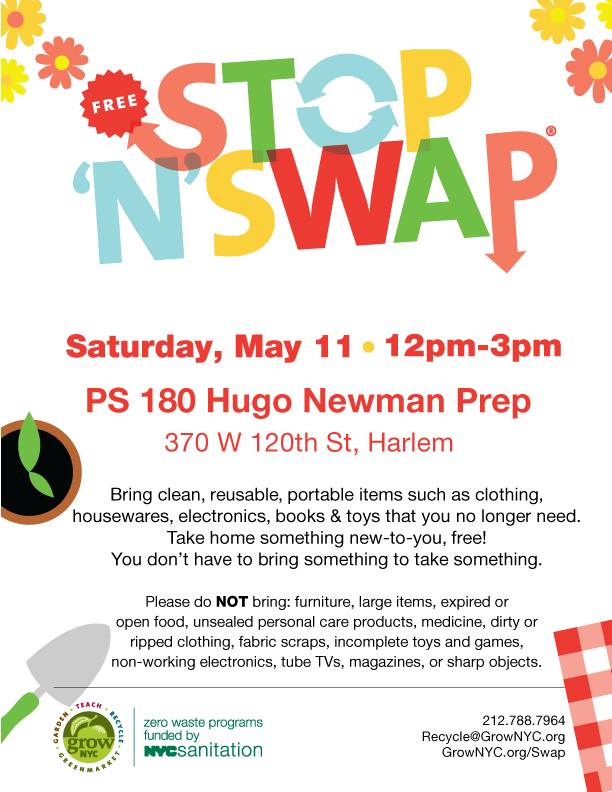 Our goal is hold a swap in every community district in NYC every year, so that we can give everyone in the city an opportunity to reduce and reuse right where they live! What should I bring to the Stop 'N' Swap? Bring yourself! Bring family and friends. Definitely bring a tote bag or two for items you want to take home. You are encouraged to bring clean, working and portable items you no longer need, but this is not required. What shouldn't I bring to the Stop 'N' Swap? Please do not bring furniture or other large items that cannot be carried away easily. See our Code of Conduct for a full list of items we do not Swap. Swaps are free of charge and all items are available for the taking on a first come, first served basis. Can I come to every single swap? You may attend up to 6 swaps per year, in the 12-month period from March-February. We're happy to provide an attendance update - just ask when you're at the Swap! Why am I limited to attending six swaps annually? Swaps are popular! 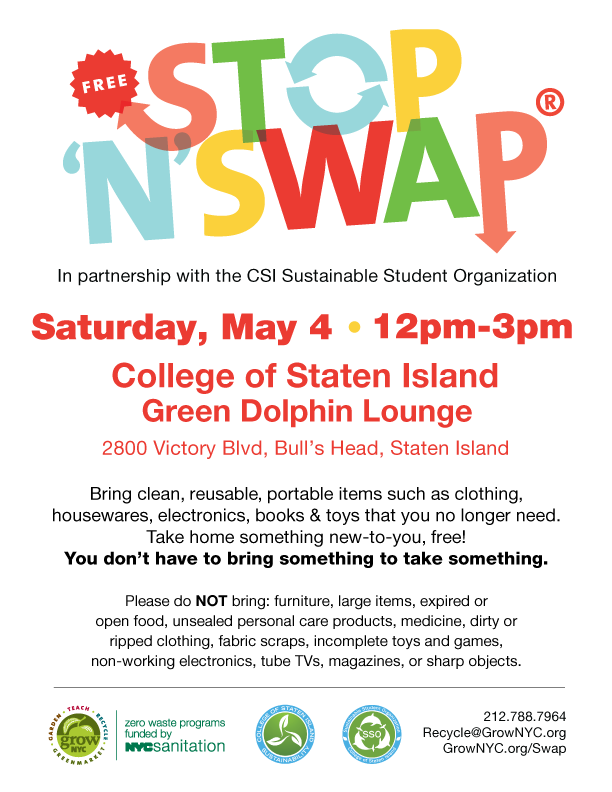 We want to make sure that everyone has a chance to experience a Stop ‘N’ Swap in a safe and comfortable environment. If I can only come to 6 swaps, and not all the swaps are up on the calendar at once, how do I plan which ones to go to? Our goal is to have one swap for each of the City’s 59 community districts, so New Yorkers can reduce and reuse right where they live! 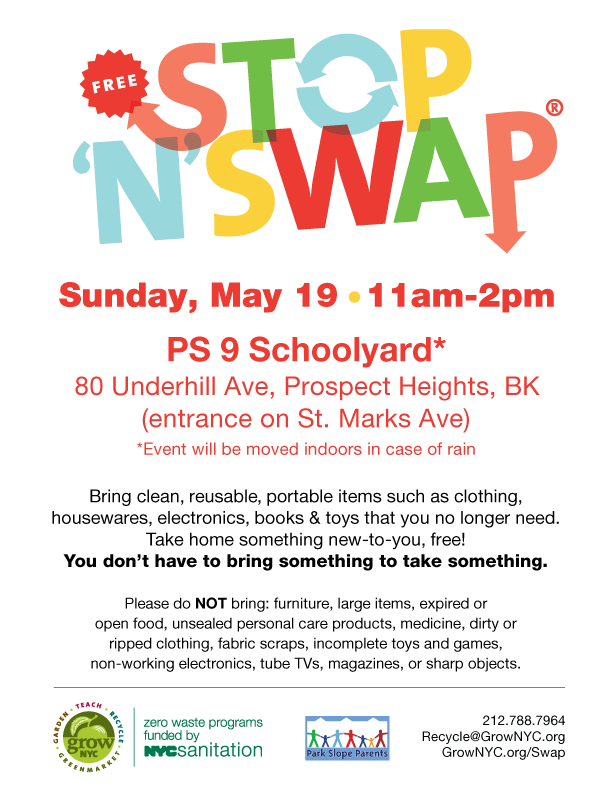 We encourage you to attend the Stop ‘N’ Swap nearest you first and foremost, but we will also do our best to post swaps online as soon as they are scheduled so that you may decide which events you wish to attend. Will I have to wait for people to take my items? Will someone watch my stuff? No. We are not responsible for personal property. Please do not leave your coat, bag or other items unattended. When leaving donations at the intake table, please be sure to hand us only that which you are giving away. Can I drop items off before the event? No. Items are only accepted during the event. We encourage you to drop off near the start to better ensure your items find a new home. What happens to items leftover after the event? Anything left at the end of the day will be sorted and recycled or donated for reuse as much as possible. Can someone pick up my donations from my apartment? How can I find new homes for large items or things I forgot to bring to the Stop 'N' Swap? Try resources like Freecycle.org or Craigslist for miscellaneous items. You can also search a list of local charities at DonateNYC.